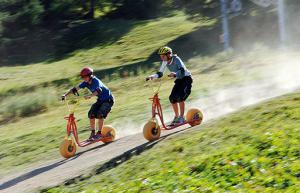 As soon as the good weather comes, in addition to the hiking, enjoy the tubbing activities and the roll’herbe, which is basically a cross-country scooter to ride down the piste. During July and August, they are opened every day (except for bad weather), from 2 to 6p.m. and until 8p.m. during busy periods. Groups under booking. The best way to renew with the sledging sensations during the winter! Helmet is compulsory. the tubbing piste. A big buoy with flat bottom and off you go for a 64 meters long slope.